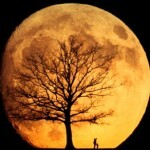 The last time the moon was as close to the earth as it will be tomorrow night, May 6, 2012, will be around a year’s time. For this, I am ready to stand outside waiting for the perfect moment. Albeit, my attire will be dictated by the weather with either a custom t-shirt or a hoodie if the air has a chill. This will be the biggest and brightest full moon of the year. It will arrive Saturday night as our celestial neighbor passes closer to Earth than any other day of the year. This would make a great rhinestone tanktop design for any lady! The super moon will orbit around 15,000 miles closer to our earth than average. It will make it appear bigger than usual. Although the moon will be hard to see a big difference. Like any full moon, it will look bigger when it’s hanging close to the horizon, which happens around sunset. I’m sure every magazine will be taking pictures. It’s called a super moon and is going to be a great deal. But don’t expect any spike in crime or crazy behavior because of it but the tides and water will be slightly affected, though. The notion of people doing weird things because of a full moon is just folklore and will be a cheap date.